I found this mushroom growing in my backyard. What is it and is it poisonous? Comments for What Type of Mushroom? this is kind of fungi will harm your trees, mainly due to acidic soil, and now widespreading in oil palm plantation and cause the palms falling down. infected palms will shown rotten in base. Thank you for your identification. I thought it is a reishi too. During my tour of Taiwan I bought some reishi.Some of the pores could have been deposited from there.It grows on some woody material. The area is under a big tree and bird's fern and orchids trives well there too. It can be difficult to truly identify a mushroom from pictures over the Internet. I'm also not familiar with what grows in your area. It's always helpful to consult a local expert on these things. 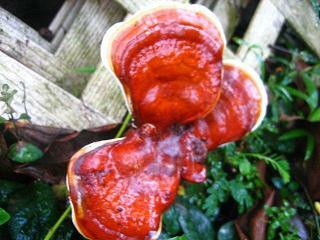 That said, your picture looks unmistakably like some species of Reishi mushroom to me. Why do I say this? - The kidney shape of the cap(s). - The brilliant reddish color. - The whitish ring around the edges signifying new growth. - The shiny, lacquered appearance. - The fact that it looks like it's growing on wood of some sort. Thanks for writing and sending the beautiful pic. It's exciting to hear from someone in Malaysia!